Today’s card is a beautiful wedding card I made for my cousin’s wedding. I used the new framelits Seasonal layers (matching the Colorful Season stamp set) to cut the flowers and branch. To add a little bit of pink to my flowers, I added a touch of pink with the watercolor pencils and used the blender pen to soften it. The birds were cut with the Bird builder punch (now retired). For the background, I used the Hardwood background stamp, with White craft ink on Crumb cake card stock. Finally the greeting is from Essence de Rose stamp set and I used the Stitched Shapes Framelits to cut the stitched oval. Colorful Seasons: Life is beautiful! One new stamp set and matching Thinlits that immediately caught my eyes in the new catalogue is called “Colorful Seasons“. It’s such as beautiful set and it’s perfect for all year long! 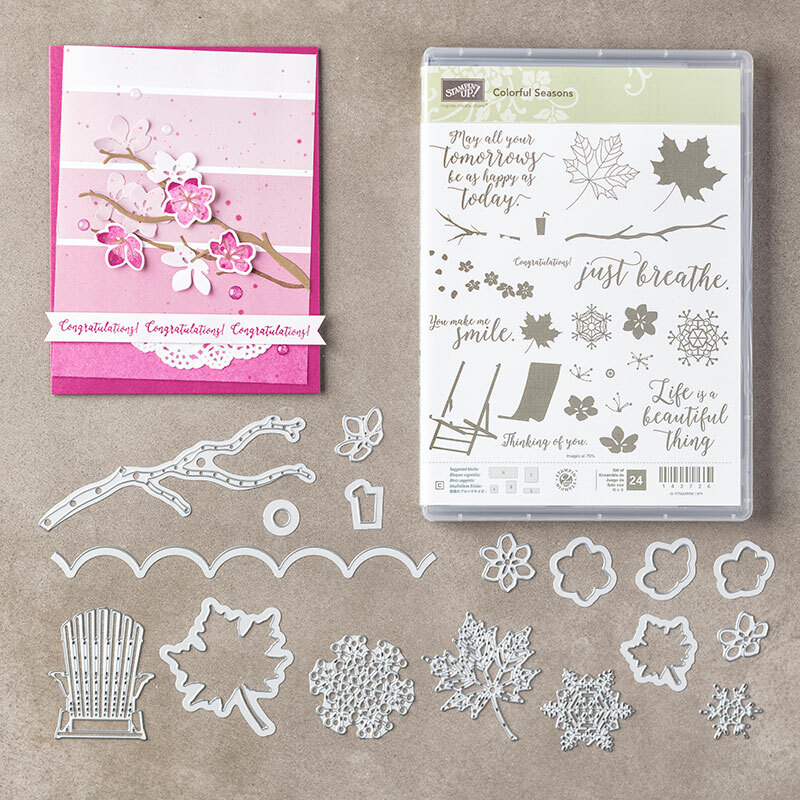 There’s everything you need for every season, from beautiful snowflakes to a nice Adirondack chair! I’ve made this card thinking of a beautiful and relaxing day on the beach! Don’t you wish you were there? To do the sky, I used the Color Theory Designer Series paper stack. I like how the blue has a nice color gradient to it! I used the darker side of the paper to do the water. A tear is perfect for this, leaving a nice white line perfect for the waves! For the chair, I used the Wood Textures Designer Series paper stack. The sun is made with the Swirly Bird stamp set.